Ahhh, salmon. Salmon hangs over my head all the time. I know I should be eating more of it. Every article about healthy food on the internet touts its benefits. But really, I just want a cheeseburger. All the time. Just tonight, our sweet friends brought dinner to our house. She texted me this afternoon and asked me to pick something off the menu at one of our favorite local restaurants. (We have the greatest friends everrrrrr, be jealous!) I spied a pizza piled with bleu cheese, steak, and creamy caramelized onions. My mouth started watering at the mere thought. But what did I pick? A salmon salad. I always feel like I must chose salmon when the option presents itself. I secretly love going to a restaurant that doesn’t have salmon on the menu so I don’t feel obligated. But, it rarely happens these days. It’s like everyone wants me to be healthy or something! But, I’m in my 30s now. It’s time to take care of myself and eat more salmon. So, I set out to create a salmon salad that I would LOVE. A salmon meal that would help me chose fish over cheeseburger. Ok, that’s a stretch. I want to eat this salad as an appetizer and still chase it with a cheeseburger, but that’s my problem, not yours. This salad makes me chose fish over cheeseburger two out of three times. And that’s a big step for me. Why is it so good? Well, first, I love the colors. I am endlessly drawn to multicolored lettuces like you wouldn’t believe. (Did you know I have my Master’s degree in lettuce production?) I’m a lettuce nerd. I brake every time I drive by a lettuce field in Monterey that has strips of green baby leaf lettuce and strips of purple lettuce. It’s just so preeeeety! A multicolored bag o’ greens is my first choice for a stunning salad. Then, I top it with extra crunchy things. Things like fresh radishes and snow peas. Highly recommend. We should talk about the salmon now. I use leftover quinoa from the day before and press it into the salmon before baking. I mix whole grain mustard into the quinoa for sticking power. I’m obsessed with Trader Joe’s whole grain mustard because it has a bit of heat to it. I think it’s horseradish? Anyway, if your mustard lacks heat, I recommend a pinch of cayenne. Oh, the sweet sweet honey lemon cinnamon dressing. Yeah, I’ve won you over now. I can tell. Let’s go forth as adults, and eat more salmon. We’ll still eat cheeseburgers on Saturdays when calories don’t count, k? Rinse the salmon fillets and pat them dry very well. In a small bowl, combine the quinoa, mustard, salt and pepper. Mix well. 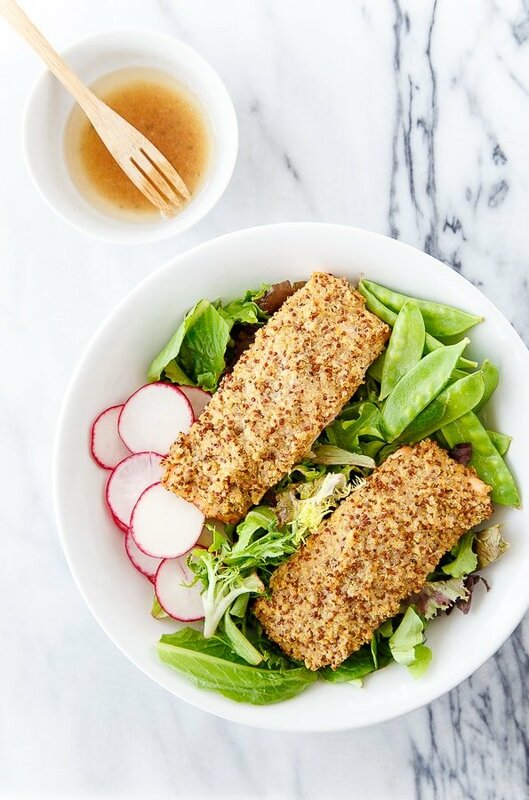 Divide the quinoa mixture in two, and pile it on top of the salmon fillets. It should stick very easily on the surface. Spritz the quinoa with cooking spray before sliding it into the oven. Bake for 15-20 minutes on a foil-lined baking sheet. Check the salmon for flakiness to determine if its done. Let cool. 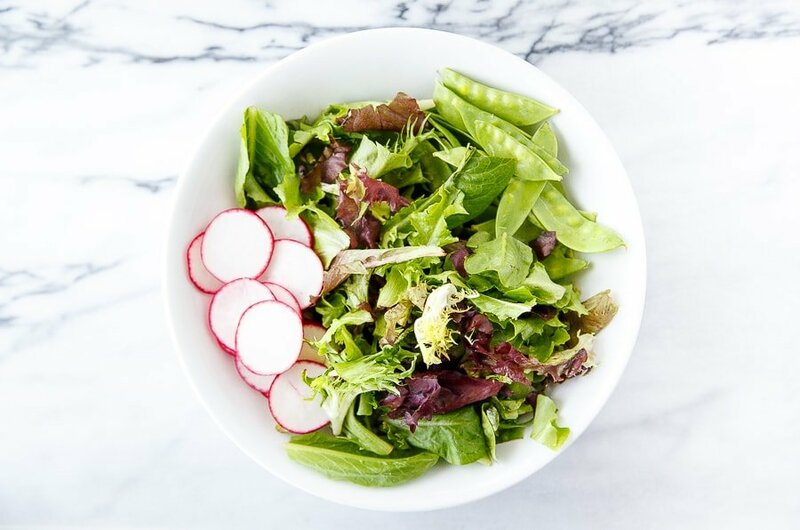 Meanwhile, in a large salad bowl, combine the salad, radishes, and snap peas. In a small bowl, whisk together the lemon juice, honey and cinnamon. Add a pinch of salt and pepper. Slowly stream in the olive oil while whisking. Taste and adjust for seasoning. 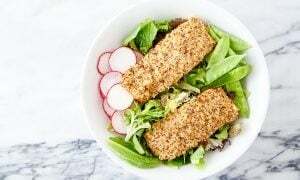 Toss the greens with the dressing, and top with salmon fillets. Divide between two plates and serve. As you know, I partner with Omaha Steaks each month to produce one fabulous dinner for two recipe. This month I used their salmon fillets when testing this recipe. I was compensated for my time and received the products for free. Thank you for letting me work with brands that I love! I’m a burger girl through and through, but I would think twice before reaching for the burger with this gorgeous plate in front of me! Such a gorgeous and healthy salad! 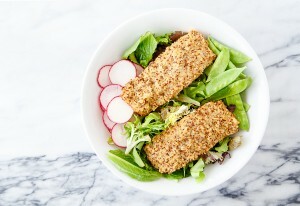 Love the colorful quinoa crust on the outside of that salmon!